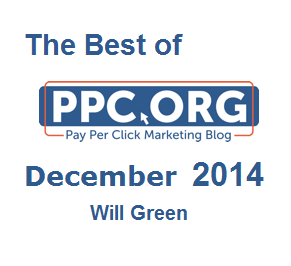 The final month of 2014 brought around some useful articles based around PPC that many advertisers will benefit from. Looking back at last month, November had a great selection of articles too and including two articles based around the introduction of Google Contributor, which I am still unsure if it is a good/bad program to allow web users to use (after all, it is basically a paid form of ad blocker)? Anyway, here are the best articles from December 2014. Every now and then, it is nice to have an article with a few general PPC tips as you will usually find that you, the advertiser, are not using at least one of these tips (and have therefore learnt something new you can implement into your campaign). 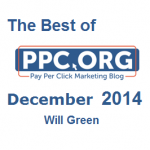 In this article, I highlight three tips advertisers of PPC can take advantage of. Should You Include Negative Keywords In Your PPC Campaign? I know this is probably the worst time to mention optimising PPC campaigns for Christmas but it’s a good article! Here, I look at what landing pages are the best to use for your Christmas campaign so you profit the most from a time of year that generally is when most businesses make the majority of their earnings for the year. For those that have websites or blogs, here is a great article highlighting three crucial mistakes many bloggers/website owners make that severely limits the success they have in search engines. Although I have not given solutions to the problems, I am sure it is quite obvious what you need to do if you are doing one of the mistakes in this article … stop doing it! Haig Club – If you are unaware what Haig Club do, they make Scotch whiskey. This does mean that they inherent the problem that comes with alcohol: age restriction. Therefore, although their campaign is clean as a whole, they have to have the landing page confirm the age of the web user so Haig Club knows if the web user is of legal age to view and buy their products on the landing page. Ted Baker – Ted Baker had a good campaign. But, it was clear from the start that they had the problem of channelling the traffic to two different sections of the website: for the Women section and the Men section. It was interesting to see how Ted Baker utilised PPC to split the traffic up between the sexes. Find Me A Gift – Find Me A Gift would have benefited massively from this campaign as it was aimed at traffic that were looking for Christmas present ideas and Find Me A Gift’s landing page was pretty well optimised to convert this traffic. There’s the top seven articles I believe I created in December 2014 that will benefit you the most. I hope this has proved useful to you like it has for so many other people.